It’s probably safe to say that when Dean Kamen created the Segway he hadn’t planned on it becoming the mall security vehicle of choice. I’m sure he wasn’t planning on his core audience being 30 and 40 somethings with fanny packs, whisking their way through a guided tour of the monuments in Washington DC. No Kamen was hoping that the Segway PT would become the next hit vehicle. A bicycle of the new millennium. Bulkiness, awkwardness and price kept the Segway out of reach of many. But like the Apple Newton or Google Glass, Kamen knew there was a category there to be created, but alas he was probably 12 years to early. Enter the INMOTION SCV. SCV stands for sensor controlled vehicle. The company, founded in China, has created a new take on the self balancing vehicle. They’ve integrated sensors, a mobile app, GPS tracking,a smart key and more into a frame that weighs just a fraction of what the Segway weighs. Not only that but at under 35lbs and with a handle bar that comes off the base of the vehicle, it can easily be put in the trunk of a car, even a small car like a mini-cooper or a smart car. Frank Yang and Aaron Gou, two of the companies founders, have left no stone unturned in their spin on the inverted pendulum. I was able to get up and ride the INMOTION SCV without any training and felt comfortable even without a helmet.. One of the cooler parts though was that the INMOTION SCV told me when I was on the vehicle properly. When I got off the vehicle it also told me that I had gotten off correctly as well. Frank and Aaron showed me how easy it was to carry the INMOTION SCV around and even showed me how it can be located using a GPS tracking app should someone decide to steal it. So how much do you think something like this would cost? 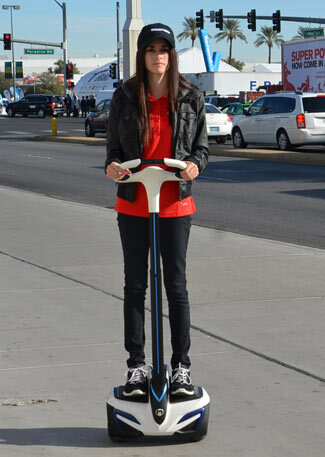 Just $2499 and in the grand scheme of things it’s a lot cheaper than a Segway and just a $1000 more than Google Glass. You can get about 12 miles out of a 3.5 hour charge which should mean you have plenty of juice for a commute to work. Then, unlike a Segway, you can store the INMOTION SCV under your desk and plug it in to charge while you’re working.